Please cycle through the pictures below and click the links to learn more about the Shinjo family. Seiyu Shinjo, the Shinjo’s first son, was Born July 10, 1929. 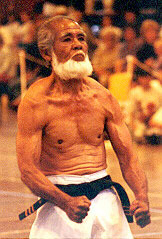 Kanbun became fond of the exuberant young Seiyu, who pleaded for years with his father to let him study karate. 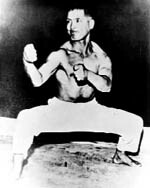 Seiyu became a student at Kanbun Uechi’s Tebira dojo in 1939. Narahiro Shinjo, Seiyu’s second son, is often lost in the shadow of his famous brother. Narahiro also inherited his father’s vigor and relentless approach to karate and is every bit as accomplished as his older brother. 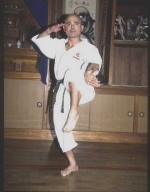 Seiko Toyama’s father watched a training session at Kanbun’s dojo and was so impressed with the strength and hardness of Uechi Ryu that he put his son’s karate training in Kanbun’s hands. Toyama and Seiyu Shinjo, who started training under Kanbun one year later, became friends for life.